Guess The Emoji is a simple game where you will see some emojis and you will need to guess what they mean. It could be anything, from a famous person to proverbs, movies or quotes. 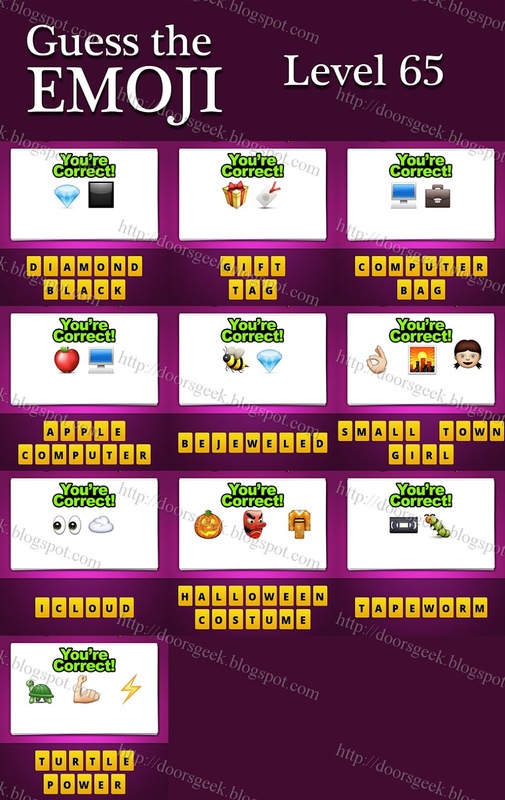 If you are stuck in Level 65 and you are looking for an answer to one of the emoji you will find the correct ones here. Diamond Black - the blue diamond/crystal and a black square. Gift Tag - the yellow gift box and a white tag with a red lace. Computer Bag - the white computer with a blue screen and a black briefcase. Apple Computer - the red apple emoji and a white computer. Bejeweled - the bee emoji and a blue diamond. Small Town Girl - the ok hand emoji, a sunset city picture and a girl face. Icloud - the eyes emoji and a white cloud. Halloween Costume - the pumpkin face emoji followed by a red face mask and a chinese costume. Tapeworm - the black tape cassette and a green caterpillar. Turtle Power - the green turtle emoji followed by an arm and a yellow thunder. Guess The Emoji Level 65 Answers, Cheats, Solution for Android, iPhone, iPad. Note: This is "Guess The Emoji" by "Random Logic Games"
Guess The Emoji is a simple game where you will see some emojis and you will need to guess what they mean. It could be anything, from a famous person to proverbs, movies or quotes. 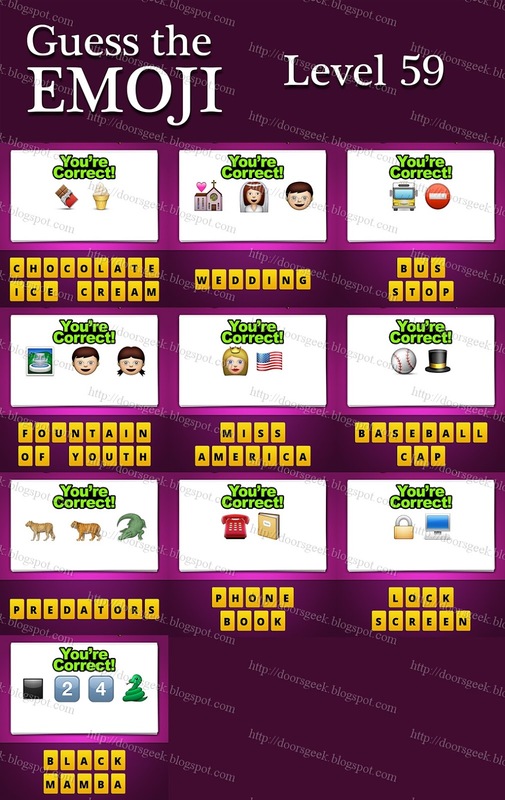 If you are stuck in Level 64 and you are looking for an answer to one of the emoji you will find the correct ones here. Paris Hilton - the american flag emoji followed by a girl, a money bag emoji and a building with a red "H" in it. Top Gun - the black word "TOP" with a arrow above, pointing up, followed by a hand gun and a white airplane. Cherry Red - the two cherry emoji and a red circle. Snap Chat - the white phone camera emoji, followed by a white speech bubble and a white ghost emoji. Fax Number - the old fax machine/phone and a blue square with "#" inside. Mother Nature - the woman face followed by a baby head, a red flowed and a tree emoji. Fosters - the koala bear head emoji and a beer mug. Peace Out - the hand making the victory sign and a white-blue tray with a red arrow above. Legally Blonde - the old scroll emoji followed by a blonde girl, a pin purse/wallet and a black video camera. Rugby World Cup - the rugby ball emoji followed by planet earth and a white cup of coffee. Guess The Emoji Level 64 Answers, Cheats, Solution for Android, iPhone, iPad. Guess The Emoji is a simple game where you will see some emojis and you will need to guess what they mean. It could be anything, from a famous person to proverbs, movies or quotes. If you are stuck in Level 63 and you are looking for an answer to one of the emoji you will find the correct ones here. Hit the Books - the fist emoji followed by 3 books colored in green, red and blue. Sunday - the white church emoji and a ted calendar. Cut a Check - the red scissor emoji and a black checkmark. Courier - the white envelope emoji followed by a cardboard box and a man riding a bicycle. Electric Power - the black power cord emoji followed by a yellow thunder and a piano keyboard. NY Jets - the blue statue of liberty head emoji followed by a american football ball and a white plane with blue wings. Standing Ovation - a boy and a girl emoji, holding hands, followed by two clapping palms. Fruit Ninja - the pineapple emoji followed by a pear, a strawberry and a kitchen knife emoji. Land Down Under - the planet earth emoji followed by a white arrow, pointing down, and a koala bear. Guess The Emoji Level 63 Answers, Cheats, Solution for Android, iPhone, iPad. Guess The Emoji is a simple game where you will see some emojis and you will need to guess what they mean. It could be anything, from a famous person to proverbs, movies or quotes. 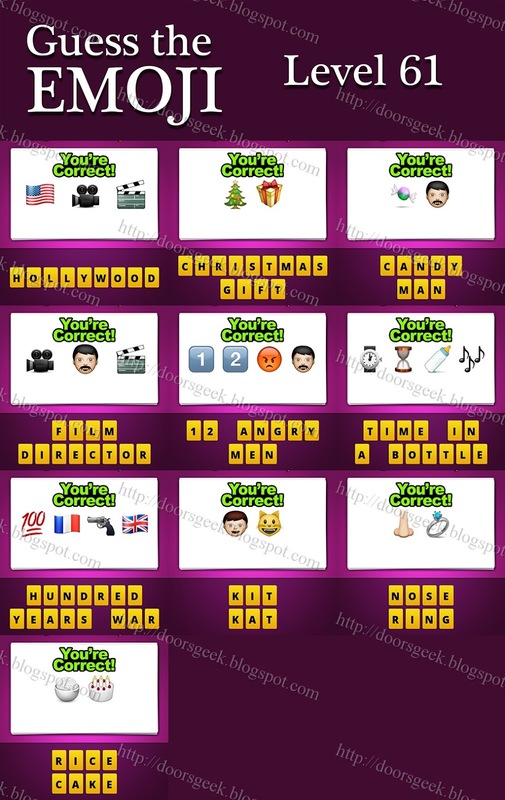 If you are stuck in Level 62 and you are looking for an answer to one of the emoji you will find the correct ones here. Pretty Woman - the pink finger nail paint emoji followed by a red lipstick, a red woman shoe and the face of a girl. Foul Play - the head of a penguin, a grey bird and a yellow bird followed by a black xbox controller emoji. British Pound - the United Kingdom flag emoji and a pack of pounds. Rainbow - the purple umbrella with 5 blue water drops above and a pink bow emoji. Justin Bieber - the boy face emoji followed by a microphone surrounded by music notes and a baby face emoji. Flappy Bird - the hand emoji followed by a smartphone and a grey bird head. Touchdown - the american football ball emoji and a blue square with a white arrow inside, pointing down. Adele - the girl face emoji followed by a black microphone, the sun behind a white cloud and a white arrow pointing down. Star Wrench - the yellow star emoji and a silver wrench. Home Sick - the white house emoji and a yellow face wearing a mouth mask. Guess The Emoji Level 62 Answers, Cheats, Solution for Android, iPhone, iPad. Guess The Emoji is a simple game where you will see some emojis and you will need to guess what they mean. It could be anything, from a famous person to proverbs, movies or quotes. 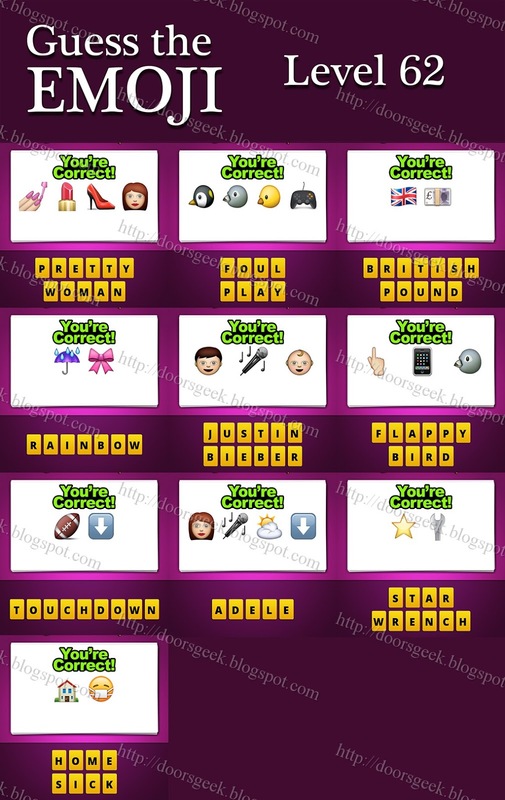 If you are stuck in Level 61 and you are looking for an answer to one of the emoji you will find the correct ones here. Hollywood - the american flag emoji, a black video camera emoji and a director's cut tool. Christmas Gift - the green tree emoji and a yellow gift box emoji. Candy Man - the purple-green candy and a face of a man with black mustache. Film Director - a black video camera emoji followed by the face of a man and a cut tool. 12 Angry Men - the number 12 emoji, a orange angry face and a man with black mustache. Time in a Bottle - the white wrist watch emoji, followed by a hourglass, a baby milk bottle emoji and 3 black music notes. Hundred Year War - the red number "100" with two lines under it, the flag of France, a black gun and a emoji represented by the United Kingdom flag. Kit Kat - the boy face emoji and a yellow cat head. Nose Ring - the nose emoji and a silver ring. Rice Cake - the white bowl with rice and a white birthday cake emoji. Guess The Emoji Level 61 Answers, Cheats, Solution for Android, iPhone, iPad. Guess The Emoji is a simple game where you will see some emojis and you will need to guess what they mean. It could be anything, from a famous person to proverbs, movies or quotes. 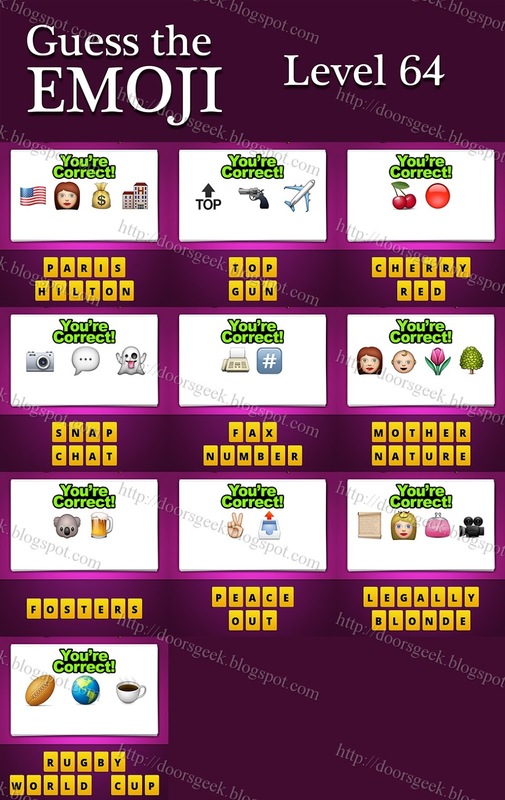 If you are stuck in Level 60 and you are looking for an answer to one of the emoji you will find the correct ones here. See No Evil - the eyes emoji followed by a girl with her hands crossed and a purple devil head. Antarctic - the blue snowflake emoji followed by a penguin head and the planet earth. Ski Pants - the green skying kit and a pair of blue pants. Outlook - the white tray emoji with a red arrow above and a pair of eyes. Atm Card - the word "ATM" in a blue square and a credit card. Rockstar - the orange guitar logo and a yellow star. Red Shoe Diaries - the red woman shoe and a blue opened book. Paintball - the painter color palette and a soccer ball. White Wine - the white square emoji and a glass of red wine. Arm Wrestle - two human arms emojies and a orange square with the white word "VS" inside. Guess The Emoji Level 60 Answers, Cheats, Solution for Android, iPhone, iPad. Guess The Emoji is a simple game where you will see some emojis and you will need to guess what they mean. It could be anything, from a famous person to proverbs, movies or quotes. If you are stuck in Level 59 and you are looking for an answer to one of the emoji you will find the correct ones here. Chocolate Ice Cream - the red chocolate emoji and a ice cream cone. Wedding - the pink church emoji followed by a bride and the face of a boy. Bus Stop - the yellow truck emoji and a red circle with a white rectangle inside. Fountain of Youth - the picture with a fountain followed by a boy face and a girl face. Miss America - the blonde girl with a golden crown on her head and the flag of America. Baseball Cap - the white baseball ball and a magician hat. Predators - the leopard emoji followed by a tiger and a crocodile. Phone Book - the red old phone emoji and a yellow book. Lock Screen - the yellow lock emoji and a white computer with blue screen. Black Mamba - the black square emoji followed by the number "24" and a green snake. Guess The Emoji Level 59 Answers, Cheats, Solution for Android, iPhone, iPad.